"The Brief: Texas House committee taking up "sanctuary cities" bill" was first published by The Texas Tribune, a nonprofit, nonpartisan media organization that informs Texans — and engages with them — about public policy, politics, government and statewide issues. Editor's note: If you'd like The Brief in your inbox every weekday, sign up here. The federal judges who said the state's congressional maps are invalid last week are in position to take another step — to require Texas to get federal permission whenever it wants to change election and voting laws. Grand jury reform legislation would allow suspects' attorneys to be present during questioning and would prevent prosecutors from going to another grand jury if the first one declines to indict – unless there's new evidence. The state carried out its fourth execution of the year, putting to death 61-year-old James Bigby. He was convicted in the 1987 murders of his friend and a 4-month-old during a killing spree in Fort Worth. Ranchers, city officials and environmentalists testified on Tuesday against a bill that would prevent cities from banning plastic grocery bags or charging a fee for them. Texas Senate tentatively approves so-called "bathroom bill"
After several hours of debate, the Texas Senate on Tuesday tentatively signed off on the so-called “bathroom bill” on a 21-10 vote. A Senate committee heard testimony on three bills that would override local regulations concerning ride-hailing companies. Opponents of legislation that would prevent cities from banning the free use of single-use bags said this measure would harm Texas livestock, marine life and cotton gins. State Sen. Paul Bettencourt's attempt to limit when cities and counties can increase property tax collections without an election drew bipartisan opposition Tuesday. But many supporters also came to the bill's defense. U.S. Reps. Beto O'Rourke and Will Hurd talked policy and personal matters while live streaming a road trip to Washington on Tuesday. The House State Affairs Committee is expected to take up legislation that would penalize local and state governments that don't cooperate with federal officials to enforce immigration laws — a move that would effectively ban sanctuary cities in Texas. The battle lines: Supporters say the bill would provide consistency among law enforcement agencies to follow same procedures, while opponents say the bill would instill a "blanket of fear" in immigrant communities, ultimately discouraging interactions with law enforcement. The Senate approved SB 4 last month. After many hours of testimony and debate, the bill, authored by state Sen. Charles Perry, R-Lubbock, passed out of the upper chamber along a party line vote, 20-11. We're expecting another long committee hearing today. Public testimony on the legislation could go on for hours. For updates today, follow Texas Tribune reporter Julian Aguilar. Texas Democrats may highlight "sanctuary industries" in their effort to fight SB 4. State Rep. Rafael Anchia, D-Dallas, said in March that Democrats at the Capitol were ready to shine a light on "sanctuary industries," or businesses that didn't fully vet their employees' legal status in Texas, to fend off anti-sanctuary legislation this session. 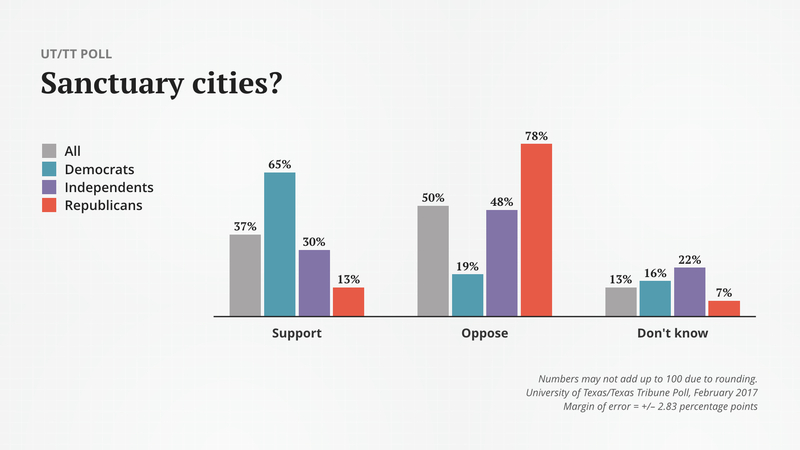 In the latest UT/Texas Tribune poll, 50 percent of Texans said they opposed "sanctuary cities," while 37 percent said they supported the practice. Join us on Tuesday, March 28, at KLRU's Studio 6A for a special screening of Beyond the Wall, The Texas Tribune's short documentary that explores the state's immigration issues through the eyes of undocumented immigrants, border patrol agents and a borderland rancher. Joseph Seinsheimer, chairman of the Galveston chapter of the Surfrider Foundation, dressed up as a self-proclaimed “bag monster” as he testified Tuesday against legislation that would prevent cities from banning plastic bags. Photo by Marjorie Kamys Cotera. See more photos on our Instagram account. "In a state with fewer than 20 clinics to serve more than 5.4 million women of reproductive age, we must address how abortion restrictions disproportionately affect low-income people, people of color, immigrants, young people and people from rural Texas communities. And yet, these same people are the ones most likely to be left out of the conversation." The Brief is written and compiled by your morning news baristas, Bobby Blanchard and Cassi Pollock. If you have feedback or questions, please email thebrief@texastribune.org. We're a nonprofit newsroom, and count on readers like you to help power newsletters like this. Did you like what you read today? Show your appreciation by becoming a member or making a donation today. The Brief: Texas House committee taking up "sanctuary cities" bill By Cassandra Pollock and Bobby Blanchard March 15, 2017 Editor's note: If you'd like The Brief in your inbox every weekday, sign up here. Tribune today Analysis: Texas could find itself back in the voting rights penalty box&nbsp; The federal judges who said the state's congressional maps are invalid last week are in position to take another step — to require Texas to get federal permission whenever it wants to change election and voting laws. Texas proposal would limit prosecutors in grand jury proceedings&nbsp; Grand jury reform legislation would allow suspects' attorneys to be present during questioning and would prevent prosecutors from going to another grand jury if the first one declines to indict – unless there's new evidence. Texas executes Fort Worth man who killed a father and an infant&nbsp; The state carried out its fourth execution of the year, putting to death 61-year-old James Bigby. He was convicted in the 1987 murders of his friend and a 4-month-old during a killing spree in Fort Worth. At Capitol, bill targeting plastic bag bans draws strong opposition&nbsp; Ranchers, city officials and environmentalists testified on Tuesday against a bill that would prevent cities from banning plastic grocery bags or charging a fee for them. Texas Senate tentatively approves so-called "bathroom bill"&nbsp; After several hours of debate, the Texas Senate on Tuesday tentatively signed off on the so-called “bathroom bill” on a 21-10 vote. Senate panel considers bills that would draw Uber and Lyft back to Austin&nbsp; A Senate committee heard testimony on three bills that would override local regulations concerning ride-hailing companies. Legislator: Some Republican men tried to retaliate over “masturbation bill”&nbsp; After state Rep. Jessica Farrar, D-Houston, filed a bill that would fine men $100 for masturbating, some Republican men in the Texas House, she said, tried to derail a separate and unrelated bill of hers Tuesday. Bill that would overturn local bag bans draws strong opposition&nbsp; Opponents of legislation that would prevent cities from banning the free use of single-use bags said this measure would harm Texas livestock, marine life and cotton gins. Senators grill one another in tense hearing on property tax bill&nbsp; State Sen. Paul Bettencourt's attempt to limit when cities and counties can increase property tax collections without an election drew bipartisan opposition Tuesday. But many supporters also came to the bill's defense. Will and Beto drive to D.C.: top things we learned from the congressional road trip&nbsp; U.S. Reps. Beto O'Rourke and Will Hurd talked policy and personal matters while live streaming a road trip to Washington on Tuesday. What you need to know The House State Affairs Committee is expected to take up legislation that would penalize local and state governments that don't cooperate with federal officials to enforce immigration laws — a move that would effectively ban sanctuary cities in Texas. The battle lines: Supporters say the bill would provide consistency among law enforcement agencies to follow same procedures, while opponents say the bill would instill a "blanket of fear" in immigrant communities, ultimately discouraging interactions with law enforcement. The Senate approved SB 4 last month. After many hours of testimony and debate, the bill, authored by state Sen. Charles Perry, R-Lubbock, passed out of the upper chamber along a party line vote, 20-11. We're expecting another long committee hearing today. Public testimony on the legislation could go on for hours. For updates today, follow Texas Tribune reporter Julian Aguilar. Texas Democrats may highlight "sanctuary industries" in their effort to fight SB 4. State Rep. Rafael Anchia, D-Dallas, said in March that Democrats at the Capitol were ready to shine a light on "sanctuary industries," or businesses that didn't fully vet their employees' legal status in Texas, to fend off anti-sanctuary legislation this session. Now, your take In the latest UT/Texas Tribune poll, 50 percent of Texans said they opposed "sanctuary cities," while 37 percent said they supported the practice. What we're reading (Links below lead to outside websites; paywall content noted with $) Trump made $150 million in 2005 and paid $38 million in federal taxes, Politico Get by without Planned Parenthood? One Texas effort stumbles, The Associated Press Texans receive first notices of land condemnation for Trump's border wall, Texas Observer Dallas police officer fired for using inappropriate force, turning off police camera, The Dallas Morning News ($)&nbsp; Texas senators slam film incentives program, Austin American-Statesman ($) Straus: Tapping our savings account will help balance our budget, Houston Chronicle ($) For your calendar Join us on Tuesday, March 28, at KLRU's Studio 6A for a special screening of Beyond the Wall, The Texas Tribune's short documentary that explores the state's immigration issues through the eyes of undocumented immigrants, border patrol agents and a borderland rancher. 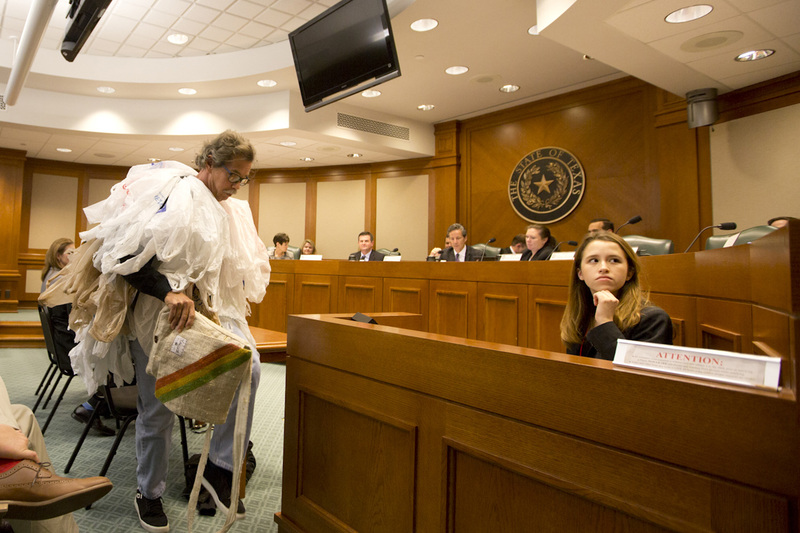 Photo of the day Joseph Seinsheimer, chairman of the Galveston chapter of the Surfrider Foundation, dressed up as a self-proclaimed “bag monster” as he testified Tuesday against legislation that would prevent cities from banning plastic bags. Photo by Marjorie Kamys Cotera. See more photos on our Instagram account. Quote to note "In a state with fewer than 20 clinics to serve more than 5.4 million women of reproductive age, we must address how abortion restrictions disproportionately affect low-income people, people of color, immigrants, young people and people from rural Texas communities. And yet, these same people are the ones most likely to be left out of the conversation." — Nan Little Kirkpatrick, executive director of Texas Equal Access Fund, and Amanda Williams, executive director of Lilith Fund, about the abortion conversation in Texas via TribTalk The Brief is written and compiled by your morning news baristas, Bobby Blanchard and Cassi Pollock. If you have feedback or questions, please email thebrief@texastribune.org. We're a nonprofit newsroom, and count on readers like you to help power newsletters like this. Did you like what you read today? Show your appreciation by becoming a member or making a donation today. "The Brief: Texas House committee taking up "sanctuary cities" bill" was first published at by The Texas Tribune, a nonprofit, nonpartisan media organization that informs Texans — and engages with them — about public policy, politics, government and statewide issues. Link back to the original article, which is located at https://www.texastribune.org/2017/03/15/brief-march-15/.